Today's destination for an early celebration of July 4th (and of the fact that the sun was finally shining) was a walk along the ocean at Lynn, MA. I took this photo from the walkway along the beach. 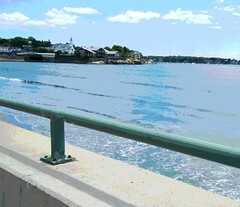 The town in the photo is Swampscott, which borders Lynn. We walked up there today to a great little sandwich and ice-cream place (called Lime Rickey's). It has outdoor tables, great if one of your lunch companions is a dog. We had sandwiches and drank egg creams. Tonight, I edited my photos from the adventures of the day, and chose this one as the best. I opened the image in Painter and used digital pastel to clean up some distracting marks on the railing, and then I posterized the picture.